This is the artist known by many around the world as "Mr. Wang"
(His real name is Wang Chang-Ming - and in Chinese, being called "old" is an honorable and respectful title). He has spent most of his life as a farmer in the countryside of Northern China. But he always had a hidden talent for art. His talent had to remain hidden for many years during the Cultural Revolution when artists and intellectuals were persecuted and killed all over China. I walked in without saying a word, he just looked up for a second and nodded at me which let me know it was okay to be there. He was working on the bamboo picture that you see above. I snapped a few pictures and waited silently. The temperature was below freezing, but somehow his ungloved agile hand smoothly created the stock and leaves of a beautiful bamboo. He finally finished and then looked at me with a puzzled face. I asked (in Chinese) how much he wanted for his beautiful charcoals... ...I saw a look of relief on his face when he heard me speak and he laughed out loud. He told me that he was worried about how he was going to talk to me, because he thought that no foreigners could speak Chinese. He said that he couldn't speak a single word of English except for "hello" (which he practiced for me several times with lots of laughter). He told me that he was from the countryside and had come to Beijing to find a better life. I looked at his unheated studio which was also where he lived. It was just one room with a small stove in one corner and a bed in the other. As I began to wonder, he answered my question before I asked it. He told me that life was a lot better here in Beijing. I picked out a few of his charcoals and didn't bargain too much - I knew he needed the money (if you don't bargain at all, you lose face in Chinese culture and are seen as a fool - so I had to a little). 2004-2005 Update: Mr. Wang has found himself a nice place to live in a village not too far from Beijing. He is in his element where he feels that he belongs, a small farming village. He likes the simple life and he is really enjoying his retirement now. He doesn't need to be in the big city much as I buy most of the art that he creates. And, since I have exposed his artwork to the world, other sellers of Asian folk art now seek him out to buy his beautiful drawings. Sometimes he comes to Beijing to drop off some of his new charcoal art to me, and sell some of his artwork at a local arts and antiques market in Beijing. When he comes to the city, I know he can't wait to get back to the country. When I am in the country picking up art from Mr. Wang or another artist, I often wonder which life is better. 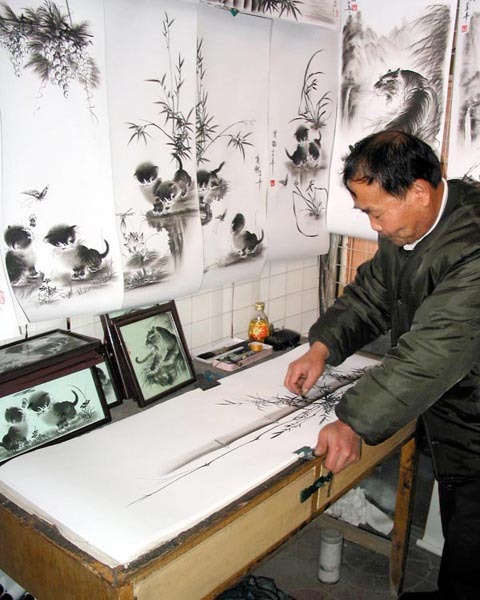 You'll quickly see how much they like Mr. Wang's Charcoal Artwork.